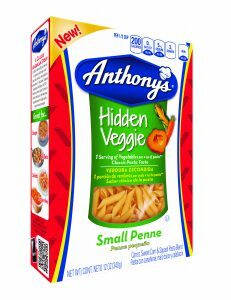 Anthony’s® Hidden Veggie Pasta is the delicious way to add the goodness of vegetables to your favorite pasta dishes by ‘hiding’ them in plain sight. Made with a blend of carrot, sweet corn, and squash, Hidden Veggie Pasta has one full serving of vegetables in every 4-ounce portion and has the same great taste, texture, and color you’ve come to trust from Anthony’s®. Add veggies to your family’s pasta night without anyone even noticing!